Wheeler Geologic Area is a beautiful demonstration of a landscape that is rapidly evolving into a truly unique panorama. 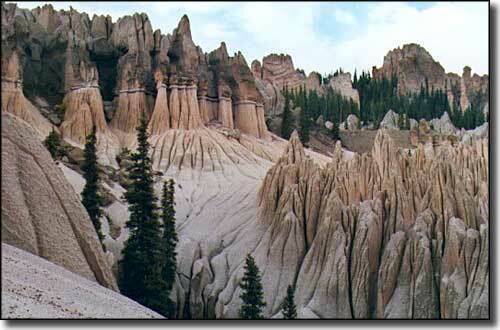 30 million years ago, the moderately coarse volcanic tuff that makes up the surface layer of the area was blown into the atmosphere by the explosion of the La Garita Caldera, near Creede. Individual particles of this tuff vary from dust flakes to blocks two and three feet across. As none of this surface layer is compacted or cemented together, the beds readily erode. What we are left with is an incredibly picturesque badlands of spires and pinnacles with extremely steep slopes that make this area almost impossible to traverse. Originally named in honor of Capt. George Wheeler, this property was granted National Monument status in 1908 (Colorado's first National Monument). Then in 1950, it was decided that Wheeler was too far from anywhere so the property was transferred to the Forest Service and maintenance funds were cut. The roads quickly fell into disuse and disrepair. The Forest Service renamed the area Wheeler Geologic Area and then incorporated it into the La Garita Wilderness when that was designated. Primitive camping (with a creek nearby) is available about 1/2 mile from the Geologic area, just outside the Wilderness boundary. From Hanson's Sawmill, a 6.8 mile hike will bring you to the Wilderness boundary. From there, a 3.2 mile loop allows you to circumnavigate the area and also allows for some nice views. As the formations of Wheeler reveal their grandeur best at sunrise and sunset, an overnight visit is highly recommended. To get there now: from Creede go 7.3 miles southeast on Highway 149 to Pool Table Road #600 (Spring Gulch). 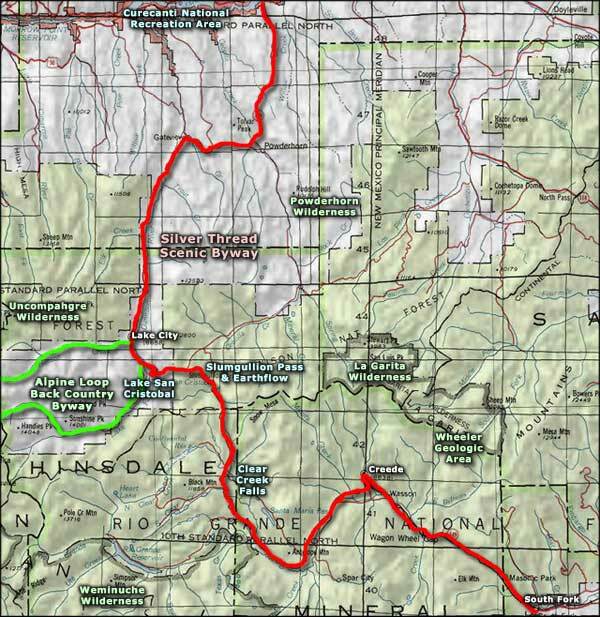 Or: coming from the south: take 149 north from South Fork for 14.3 miles to the junction with Pool Table Road. From the turn onto Pool Table Road, turn north and travel northeast approximately 9.9 miles. This portion is 2WD. You'll come to a sawdust pile marking the remains of the old Hanson's Sawmill. Depending on your vehicle, you can choose to park here and hike the well-marked trail or continue on the 4WD road that winds northeast and then northwest around Pool Table Mountain for just under 14 miles to the boundary fence of the Wheeler Geologic Area. The Forest Service warns that only high clearance 4WD vehicles have a chance on this road (forget your Subaru) and it is impassable when wet. 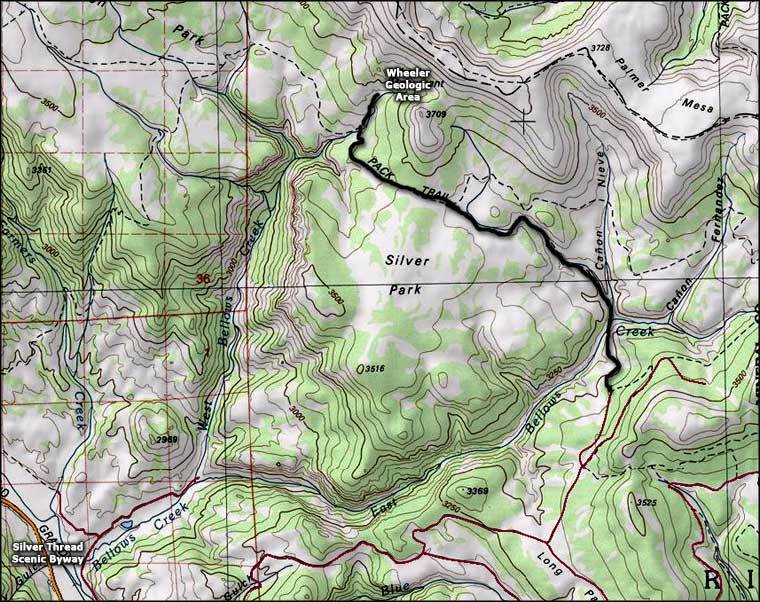 On the hiking approach, the trail wanders easily through forested areas for 2.1 miles before dropping down to East Bellows Creek (the boundary of the La Garita Wilderness). In fall, fording the creek is easy but spring runoff can make this ford very challenging. The obvious trail from here leads into a series of canyons. At each canyon bifurcation, stay left. At about 3 miles (from the sawmill), the trail climbs out of the canyons and rises steadily through open parks and stands of trees until reaching treeline about a mile later. From here, the well-worn trail crosses high meadows, passing the odd pole marker along the way, until you reach the junction with the 4WD road at 5.7 miles (from the sawmill). The last 1.1 miles to the boundary of the Wilderness Area follow this road to the Wheeler Geologic Area trailhead. Along the way, you will gain 1,140 feet and lose 1,050 feet in elevation (which you will do again on your way out) in this 6.8 mile walk. From the Geologic Area trailhead it's 0.4 miles to the trail junction with the Wheeler Geologic Area Loop Trail. From this trail junction the 2.8 mile Loop Trail goes straight ahead or to the left and works equally well whichever way you choose to go. There are observation points along the way (even a bench at one) and the high point of the trail is at 11,900' where the Loop Trail meets the Half Moon Pass Trail about halfway around the loop from the beginning trailhead.